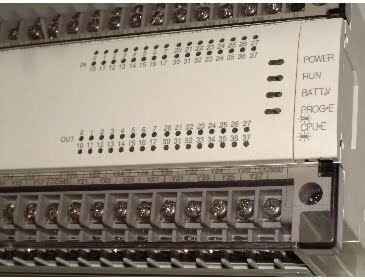 If you are working with some very Old PLC in which you cannot even read which is input(I/P) and which is output (O/P) then this article can really help you out. After reading this article you will easily able to tell which is Input terminal and which is output terminal.We can see that in many ways PLC input and output are designed or written. PLC input/output can be written upside-down, can be written in Left and Right, can be directly given in some numbers, and may be there is case where nothing is mentioned and you have to predict on seeing the distance. Subscribe to Automation-Talk by Email . Ways to Identify Input and Output Terminals in PLC :Below are some ways which will teach you how to identify PLC,Relay, Contactors input and Output. You can identify the PLC if you have only a series of Number of I/O's. Generally if you given a number series like 1,2,3,4,5,6 then lower numbers are always Inputs (I/P) and Higher number are always Outputs (O/P). If you have the PLC in which there are terminals upside and down side, then you can say that Upside terminals are Input and Down side Terminals are Outputs. If you have a PLC having terminal in Left and right Side, then you can say that left side terminal are Input and Right side terminals are outputs. 4.If nothing is mentioned on the PLC then you can say that distant terminal are inputs and near terminals are Outputs. Hope now you can easily tell on seeing a PLC which is a output and which is Input. You should also note that Input are always large in numbers then output in many PLC's. Subscribe to PLC,SCADA,HMI Programming and Tutorials by Email for more Tips and Tutorials.